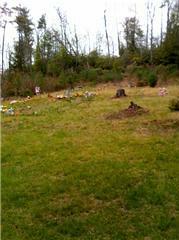 Dark Hollow Cemetery is located on Dark Hollow Road in Roan Mountain, Tennessee (Carter County). The cemetery is actually divided into two sections. If you are coming from Sugar Hollow Road, the old section will be on the left and the newer on the right. You will find that a majority of the graves in the old section are nothing more than unmarked stones. The most common story that seems to come up about this place is that of Delinda. Delinda was known to be a "lady of the night" so to speak, a lover of all the town's men. She fell ill and all of the town's men followed suit. This angered the wives. They went to Delinda's house to settle their business. She was no where to be found. On the same day, one of Delinda's favorite lovers, Jankins, accidentally shot himself. When his coffin was being carried to the grave, it was noticed to be a lot heavier than what would be expected. Delinda was never seen again. It's said that her love for Jankins was so strong that she climbed into the coffin with him. Rumor also has it, that if you drive by the cemetery at night, you will feel a bump in the backseat. This is Delinda hitching a ride out. Some sources have commented that Delinda may of also been a witch. This could relate to the Teaberry Road Grave given it's close proximity. We made two different stops at Dark Hollow. The first was around 3:30 in the afternoon as a scouting trip being we were not familiar with the area. We did a walk through, examined the graves, and snapped a few quick shots. There are two parts to this cemetery, on each of the sides of the road. We checked out the older side. We saw nothing, but we tried to talk to the spirit Delinda. The first time we said her name we heard a shriek from behind us, perhaps the other part of the cemetery. At one spot (and I mean only one spot) we could see our breath, but there appeared to be no coldspot. It didn't get colder, like in the Morgan Branch graveyard. Our breath could not be seen once we stepped away from the cemetery. We did not have that same feeling of being watched/followed.